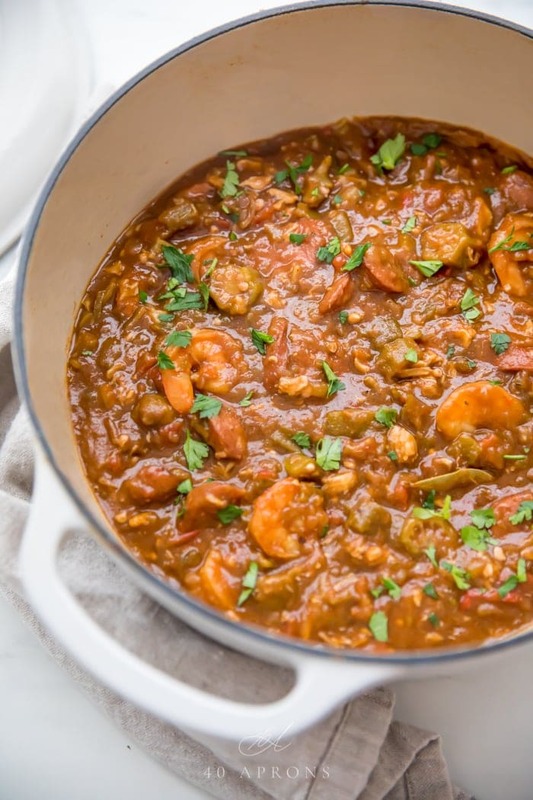 This healthy and gluten free seafood gumbo tastes just like an authentic New Orleans recipe, thanks to a rich roux. 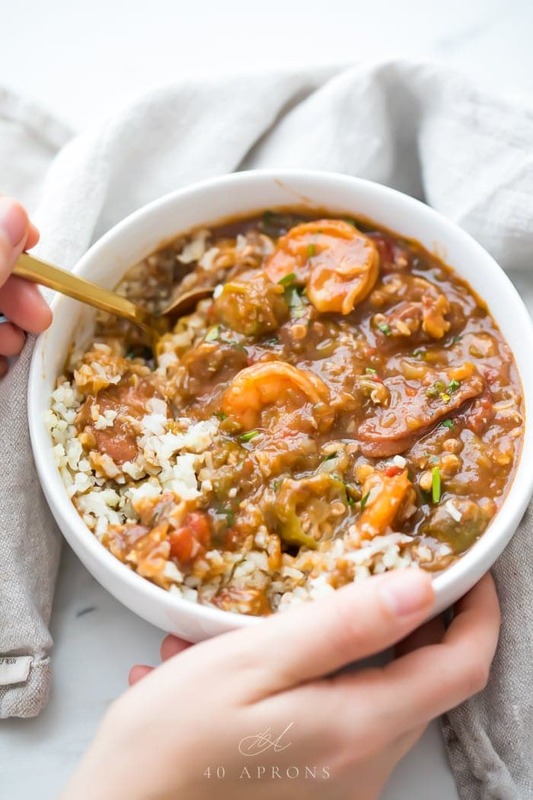 With sausage, okra, shrimp, and crabmeat, this seafood gumbo is super hearty and paleo, Whole30, and low carb. It’s not a quick meal or shortcut recipe; it’s the real deal! I’m going to make a bold statement, my friends. But I’d like to think that’s OK because, well, I don’t live in New Orleans. I never have. But I live in Memphis: close enough that it’s a prime spot for Nola transplants (and the restaurants that come along with them!). And it’s close enough that we dash down there whenever we can, embracing the powdered-sugar-coated street corners and the poboy shop tucked away behind a Walgreens with BBQ shrimp that will blow your mind and the second lines and the deep, dark roux slowly beckoning the Holy Trinity of onions, celery, and bell pepper. Gumbo is not gumbo if it doesn’t have a roux. Quick and easy need not apply here! And sure, a little gumbo hack here and there isn’t so bad. But it hurts me to even call it gumbo: let’s call it chicken and sausage stew with okra. Because really? That deep, mahogany roux that took you longer than an episode of This is Us to get just right? That’s the key to a really damn good gumbo. That and the simmer time. Oh, lots of simmer time. Usually I’m all about the quick and easy recipes, my Restaurant-Style Chicken Tikka Masala excluded. Usually, for a weeknight, I jam as much flavor into as simple a process as I can. But when it comes to really rivaling top-notch dishes you’ve had out at fantastic Cajun restaurants or, for example, the chicken tikka masala at that amazing curry house you stumbled upon during your trip to London? You’ve gotta give it time, the right ingredients, and some real, real love. It’s a real gumbo made gluten-free. The roux is deep, dark, and rich but isn’t made with all-purpose flour. It’s Whole30, paleo, and low carb, but you would never know it! 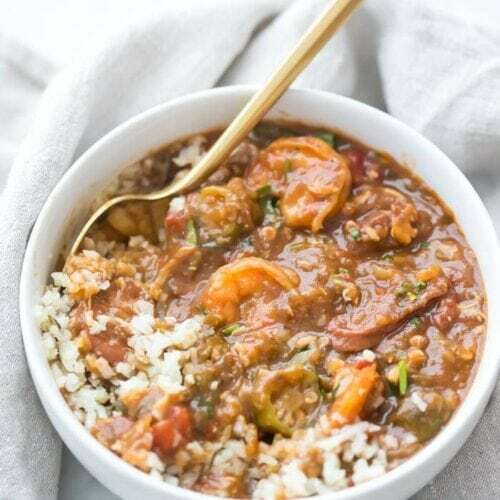 The seafood gumbo is loaded with sausage, shrimp, crabmeat, tomatoes, and okra, making it super hearty. It goes beautifully over a bit of steamed cauliflower rice or regular white rice. 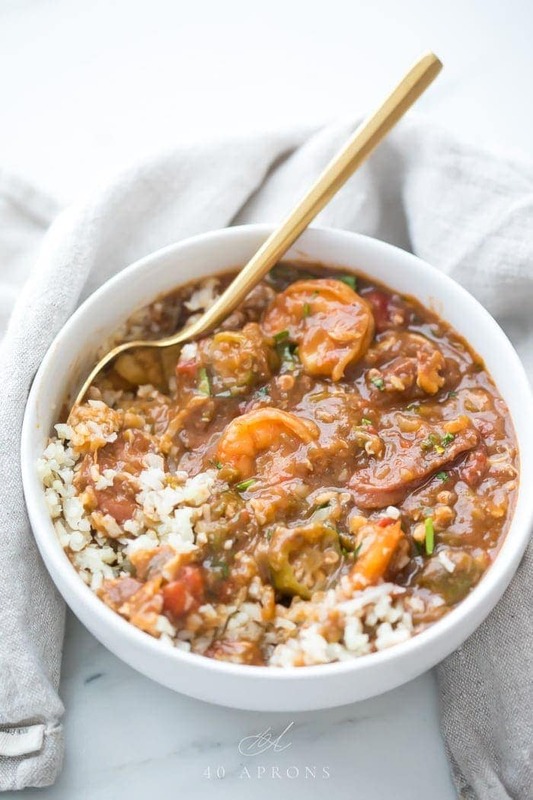 This recipe is based off an authentic family seafood gumbo recipe, so if you don’t believe tomatoes belong in gumbo, well, then… take it up with the family! Just kidding, take it up with me, because you’re so wrong, my friend! Really, though: typically we find tomatoes in okra gumbo and no tomatoes in non-okra gumbo. Since there’s okra in this one, we’ve got the tomatoes, too. Interestingly, the presence of tomatoes also makes this dish more Creole than Cajun. Is this seafood gumbo low carb? Yep! One serving has 10g net carbs, making it a low carb option and even keto friendly. Serve over cauliflower rice if low carb (If keto, cauli rice might put you over the daily max grams net carbs with this recipe). You can prep the rest of your veggies whilst working on the roux but only for a minute or so at a time before checking back on the roux! While the roux cooks, pulse your celery, onion, bell pepper, and garlic together in a food processor a few times until the mixture is chopped pretty fine and uniform. When the roux is ready, stir this “Holy Trinity” (the celery, onion, and bell pepper, plus garlic) mixture and the sliced sausage into the roux and stir to mix well. Stir in a cup of water and whisk to combine. Simmer this mixture over medium heat until the veggies are softened a bit, about 15 minutes. To keep the mixture from scorching on the bottom, add the 2nd cup of water during this process, if necessary. In the meantime, bring the 4 cups of beef broth to a boil in a medium saucepan. If you have not used the 2nd cup of water yet, add it to the saucepan and heat with the broth. When the roux-vegetable mixture is ready, stir the hot broth into the mixture in the Dutch oven and whisk well. Stir in the coconut aminos, salt, hot sauce, Cajun seasoning, bay leaves, thyme, and diced tomatoes; stir. Simmer for 2 hours over low to medium-low heat. You don’t want it boiling and you don’t want it doing nothing; you want a nice simmer with consistent bubbles but not too much activity. If you have gumbo filé (Lucky duck! Oh, and it’s pronounce fee-lay, though you’ll sometimes see it written without the accent. ), add 1/2 teaspoon to the gumbo after 1 hour of simmering. While the gumbo simmers, heat 1 tablespoon avocado oil or more bacon grease in the medium saucepan used to heat the beef broth (or a skillet). Add the okra and vinegar; cook over medium heat about 5 minutes or until it’s softened and bit sticky. Stir the okra into the gumbo, then add the crabmeat, shrimp. Simmer for 45 minutes over low heat. If you have gumbo filé, stir in 1 teaspoon. Serve with a little steamed cauliflower rice. Stir it in to your gumbo or pack a 1/2 cup measuring cup full and invert it in the center of a serving bowl of gumbo. Garnish with chopped parsley. What makes this seafood gumbo healthy? Since there’s no all-purpose flour, there’s no gluten to contend with in this recipe. That means it’s suitable for those with gluten sensitivities, intolerances, and allergies (like Celiac disease), as well as suitable for those on a paleo diet or Whole30. In addition, there’s no added sugar, neither refined or unrefined. Finally, there are no weird preservatives or strange additives! And yes, of course this recipe can only be *so* authentic since it doesn’t include regular ol’ white flour. But cassava flour is damn close, and it produces as beautiful a roux as I’ve ever made with plain all-purpose flour! I highly recommend you pick up a bag of cassava flour, as it works so beautifully in other grain-free recipes, too. Almond flour, tapioca starch, and arrowroot powder will not work in place of cassava flour for this recipe. 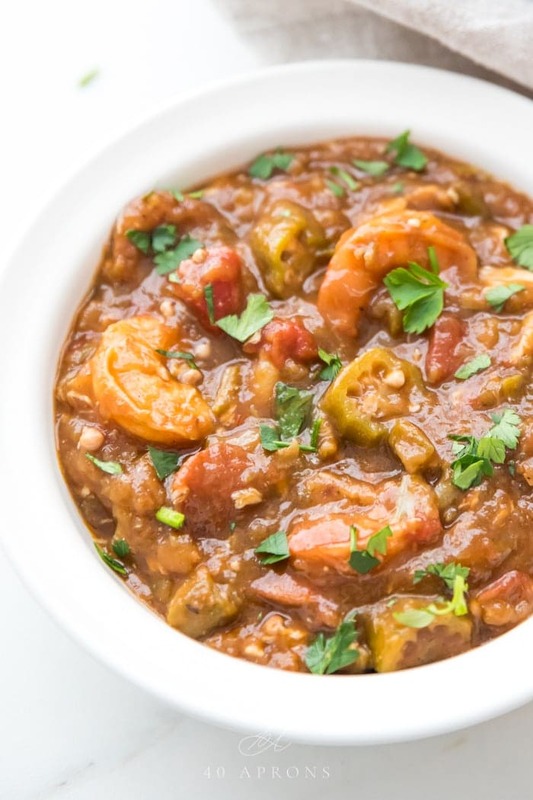 An authentic New Orleans seafood gumbo turned healthy, gluten free, paleo, low carb, and Whole30. With a real, rich roux, sausage, shrimp, and crab. Make your roux: heat 1/3 cup bacon drippings in a large Dutch oven over medium-low heat. Sprinkle in cassava flour and whisk until a smooth paste forms. Cook this mixture, whisking almost constantly, for about 30 minutes, or until it turns a deep amber color. Don't let it burn - let this process happen slowly and gradually. This is what gives a real gumbo its rich flavor! Meanwhile, add your celery, onion, bell pepper, and garlic to a food processor and pulse a few times until the mixture is finely chopped. When roux is a rich amber color, stir in the celery, onion, bell pepper, and garlic mixture; add the sliced sausage. Stir well then add 1 cup water and whisk well. Bring the mixture to a simmer over medium heat and cook until the vegetables are softened a bit, about 15 minutes. Add the second cup of water, if needed, to keep the mixture from burning on the bottom of the Dutch oven. Meanwhile, bring 4 cups beef broth to a boil in a medium saucepan. If you have not used both cups of water yet, heat the 2nd cup of water with the beef broth. Stir hot broth into the roux-vegetable mixture and whisk well. Stir in coconut aminos, salt, hot sauce, Cajun seasoning, bay leaves, dried thyme, and diced tomatoes. Simmer for 2 hours over low to medium-low heat. If you have gumbo filé, add 1 teaspoon to the soup after 1 hour. In the meantime, heat 1 tablespoon avocado oil or more bacon grease in a skillet or the saucepan used to heat beef broth. Add the thawed okra and vinegar and cook over medium heat for 15 minutes or until sticky and softened. Stir into gumbo, along with crabmeat and shrimp. Simmer 45 minutes over low heat. If you have gumbo filé, stir in the remaining 1 teaspoon right before serving. Serve with steamed cauliflower rice: stir in a little to your gumbo or invert a packed 1/2 cup of cauliflower rice on top of gumbo for presentation. Garnish with chopped parsley if desired. If you don't have bacon drippings, substitute a fat like avocado oil. If you're not on a Whole30 or grain-free, Andouille sausage is best here. It's more authentic when you have Andouille! Make sure your Cajun seasoning is compliant! You can also make it easily. I left gumbo filé out of my recipe testing because it can be so hard to find. Use it if you have it, but don't stress if you don't! 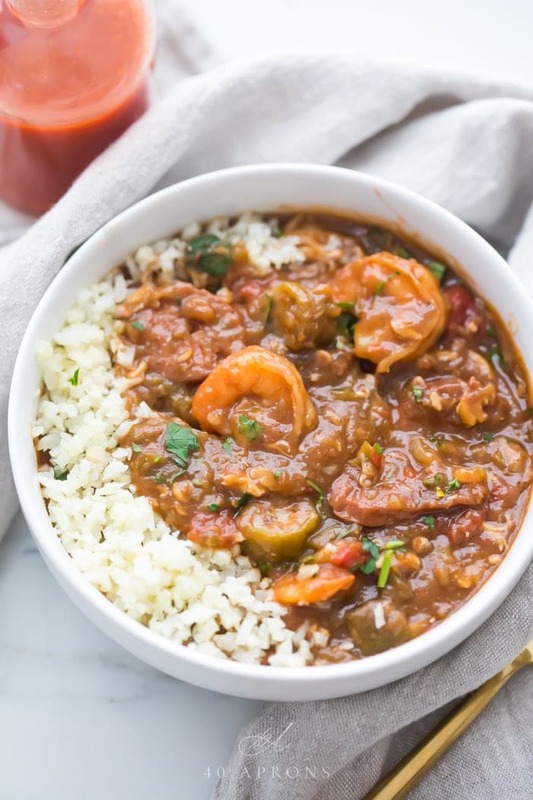 Click here to order gumbo filé. Just made this today. Perfect rainy day meal to make while confined at home. Um, delish. Made it exactly to the recipe. I feel like an accomplished cook now that I made a roux. It took almost an hour to get it to that good amber color. But that’s ok. I was scared to burn it. Thank you! PS made the Paleo brownies too. Yum! Yaaas! This looks awesome! I love that its the real thing and not a short-cut. Sometimes great food takes time! Definitely! Delicious things come to those who wait sometimes. Haha. I’m so happy you like it! I haven’t had gumbo is a long time! This is making me want to change that! I love the idea of cauli rice too! This looks soooo tatsty and so full of flavour! Wow, such special and BEAUTIFUL comfort food! Love! Love gumbo! Healthy delicious comfort food! 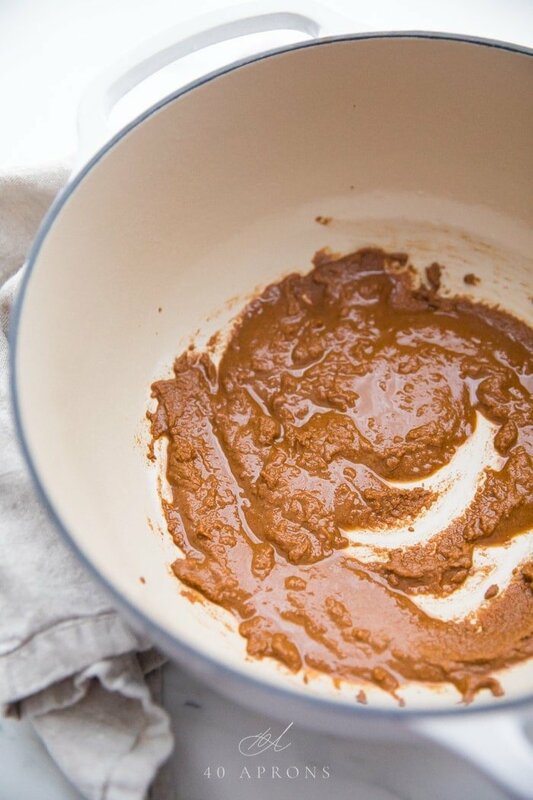 OMG – a Paleo-friendly roux? Made with bacon fat? Yes, please. I am all over this recipe. Can’t wait to try it. It is really amazing! I’m so excited for you to try it. Let me know what you think! I love your explanation for a true, authentic gumbo with that rich, traditional roux. You’re right, the other is just a stew. Your version is perfect! How fun that you live close enough to go visit some of those awesome restaurants in New Orleans too! Yes, I love going to New Orleans whenever we can. Thank you so much! This made my day! so great to know you can do a roux with cassava!! I’ve struggled making a gluten free roux in the past! I loooove gumbo, and I haven’t had it in ages! This looks delicious!